Which Party is For Small Government Again? Democrats want to expand the role of government. Republicans want to shrink it. At least, that’s what their rhetoric says. The story becomes a bit harder to believe when looking at government spending statistics. Consider two presidents as an example. President A increased spending by $357 billion over the first seven years of his presidency. Over the same period, President B increased spending by around half as much, $160 billion. Who is President A? The legendary champion of small government, Ronald Reagan. President B? None other than the evil Kenyan dictator, Barack Obama himself. 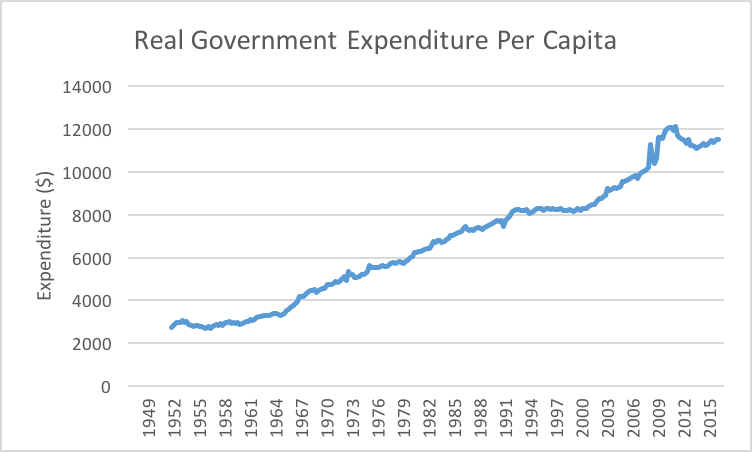 Let’s look at a graph of total spending per capita over time (data from the BEA). I don’t see any clear party breaks. The one big slowdown in spending in the 1990s coincides with Clinton (a Democrat). Breaking the data down by president makes the point even clearer. 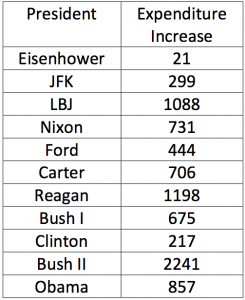 The table below shows how much spending per capita increased over each presidents tenure. Note that Obama’s numbers are skewed by stimulus spending. Measuring from 2009 Q2 drops the increase to $153. Overall, Republicans have held office for 36 years since 1953 and increased government spending per capita by $5310 during that time ($148 per year on average). Democrats were in power for 27 years and increased spending per capita by $3167 ($117 per capita). Not a single president in either party has actually reduced the size of government by this measure. A natural question is whether control of the senate or house is more important than the president. I didn’t calculate the numbers, but I doubt it would help the Republicans, who had control of the senate during the expansion in spending under both Reagan and Bush. Bill McBride at Calculated Risk keeps a tally of public and private sector jobs added by president. By those numbers, Obama is the only president since Carter to decrease the total number of public sector jobs. Again, there is no clear relationship between party affiliation and number of jobs added. On taxes, the picture looks strikingly different. Performing the same exercise shows that Republicans reduced taxes by $23 per capita per year, while Democrats increased taxes by $278 per capita per year. So maybe you could argue that the Republicans have kept half of their small government promise. But both parties clearly like to spend. At least the Democrats seem to care about paying for it. Disclaimer: I am not deeply familiar with the subject, being non-American (I am especially illiterate in historic perspective), so please forgive any errors I am making. 1. In general, I agree with your thesis that both parties are not great at controlling the government spending. However, my claim would be that still Republicans are for less government than Democrats. 2. To me, both parties are OK with spending, question is in needs. For Rs goverment’s primary function is defense, for Ds – tool for improving the “well-being” of the nation. Spending is not bad per se, only in terms of the goals it is used for. Few Rs would blame FDR’s spending for WW2 efforts, but many would blame him for New Deal spending (and for Ds New Deal is an example of great policy). So, it is not clear that mere expansion of government under a president is “bad”, you have to look what it was spent on. 3. For instance, compare Carter and Reagan, 704 vs 1198 in your table. Carter is famously “the one without any wars”, while Reagan’s spending was aimed at defense and offense against the USSR. So, by R standard Carter’s increase is not justifiable while Reagan’s is (however, I would note that many still blame Reagan for debt expansion, including Rs, while Ds still argue that all the borrowed money was wasted on “useless wars” while domestically people were struggling, related to stock market crash and, say, uptick in crime). 3a. A minor addition: should your number be somehow weighted for time in office, per year or per term (then, per term Carter vs Reagan is 704 vs 594, which is a reversal). Correction for term “feels right” (e.g., say there is some natural growth in government spending linked to economy expanding), but I am not fully convinced. 5. I disagree on taking stimulus out for Obama – why? Spending is spending, and stimulus was a big deal. 6. As for G. W. Bush, again, his expansion is defense related to a great extent, but then he was not really a small government guy – he called himself “a compassionate conservative”, and his failure with regard to spending is an accepted point among Rs. 7. However, I would say that using President’s party to quantify actions on small government is wrong. I’ve often heard that “Congress creates the budget, and the President gets to edit it a bit”, and arguably the Speaker is more important then the President. In fact, in the end budget is a compromise between the Congress and the President. If you look at that, a lot of your “puzzles” go away. 8. Obama had D Congress up to first midterm, when most of the expansion happened. After House has leaned to the right A LOT (meaning both switching control and entrance of the Tea Party), government expansion has slowed a lot. In fact, Ds talked about stimulus being the new norm. I cannot find it at the moment, but a while ago I saw a chart comparing Obama budget proposals with what was implemented. After 2010, the was a significant difference due to R House control, who have slowed the spending growth compared to President’s wishes, though failed to actually make significant cuts. 9. Similar story is about Clinton – slow government expansion is due to Gingrich and Kasich, who actually forced a shutdown over cuts (similar to Boehner, but with actual success), as well as have implemented things like welfare reforms. In fact, a lot of Clinton economy is due to the Congress, not the President, who at the time ws opposing the measures he is now taking credit for. 10. I think state budgets might be more telling in that regard, and there you can actually find examples of big budget cuts (e.g. Jindal’s LA). I think comparing government sizes in solid blue vs solid red states might be more telling about parties’ views on small government. However, the dynamics might be less useful there, due to potential challenges with respect to shifts of mandates between federal and state governments, but levels should be fine. 11. Another potential issue could be difficulty in distinguishing between parts of the budget that government controls vs entitlements (I mean per person benefits increases which Congress controls versus the fact that say aging population mechanically means more spending on Social Security and Medicare). Good points and I think you’re right on most of them. I don’t want to break down all of the numbers regarding military vs social spending, but I suspect you’re right that the Republican numbers are heavily skewed towards military. I still think Bush would be on the high end even without his military though. On congress, it definitely helps the Republicans in the Clinton and Obama years, but they lose Eisenhower’s low spending and keep Reagan’s high spending. Again I don’t want to calculate, but eyeballing the numbers I doubt it would change the story doing it by control of congress rather than president.